PHILADELPHIA, PA – September 7, 2017– Janney Montgomery Scott LLC (“Janney”), a leading full-service wealth management, financial services, and investment banking firm headquartered in Philadelphia, PA, announced today that Brendan P. Flaherty, Senior Vice President/ Wealth Management, and Sandra Cummings, Financial Advisor, have joined Janney’s Providence, RI branch office. Flaherty and Cummings are accompanied at Janney by Susan F. Beard, Senior Registered Private Client Assistant, and were previously affiliated with Merrill Lynch. Flaherty and Cummings are entrusted with over $230 million in client assets and both hold the Certified Financial PlannerTM designation. Additionally, Flaherty holds the Certified Investment Management Analyst advanced designation and is Program Director of Bryant University’s CFP® Program, where he is also a Professor of Finance in the undergraduate program. He is also Chairman of the Financial Planning Association of Rhode Island. 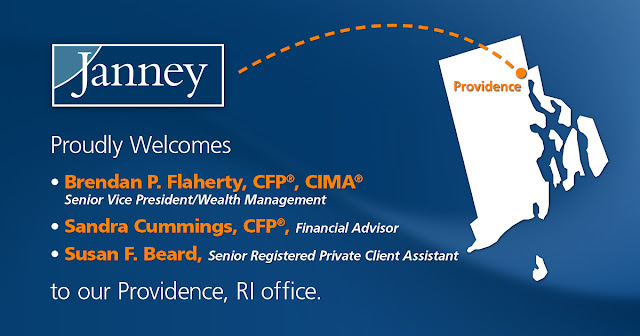 Janney’s Providence, RI branch office is located at 1 Turks Head Place, Suite 700, Providence, RI 02903.